The Relationships pane creates relationships between tables, but requires a compatible data type between the parent/child columns and doesn’t create a lookup list. In any database with at least two tables or queries, select Database Tools > Relationships. 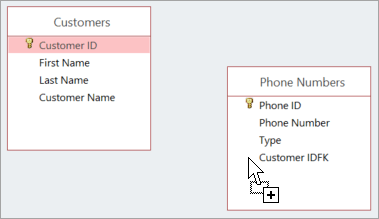 If the Relationships pane is blank, drag the tables from the Navigation pane to the Relationships pane. Drag the primary key from the parent table to the top of the foreign key in the child table. Select Cascade Update Related Fields and Cascade Delete Related Records. You’ve added the relationship between the two tables, so now you see a line that shows the relationship type (one-to-one or one-to-many) and indicates which fields are related. To save the relationship, select Save . One way to create a relationship between tables is to use the RELATIONSHIPS PANE. This is an alternative to using the Lookup Wizard. Here's what the Relationships pane looks like. These are the tables involved in the relationship, and the line tells you whether it's a one-to-many relationship. Unlike the Lookup Wizard, the Relationships pane doesn't create a lookup list for you, but you might not need one. If you use queries to extract and process your data, you need the relationship, but not the lookup list, because the query provides the data you want to see. To use the pane, select Database Tools, then Relationships. If the pane is blank, you can drag your tables from the navigation pane like this. Another difference from the Lookup Wizard is that when you use the Relationships pane, your child table has to have a foreign key with the same data type, or a compatible data type, as the primary key. There's our foreign key. To create the relationship, just drag the primary key over to the foreign key and let go. Now select the check boxes for referential integrity, cascading updates, and cascading deletes. Then select Create. Press Control-S to save your relationship diagram layout changes. There you go. You’ve now created a one-to-many relationship by using the Relationships pane.